Red clothes + scarecrow = bad news. The Skinny: More Japanese horror courtesy of director Norio Tsuruta (Ring 0), based on a comic by Junji Ito. As horror exercises go, this glacially-paced thriller has its share of creeps. It also has its share of unexplained and undeveloped phenomena, and characters that are hard to care about. 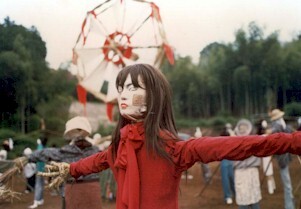 Scarecrows are the evil du jour in this manga-based horror flick from director Norio Tsuruta (Ring 0). Maho Nonami stars as Kaoru Yoshikawa, who's in search of her missing brother Tsuyoshi (Shunsuke Matsuoka). A letter from old classmate Izumi (Kou Shibasaki of Battle Royale) leads Kaoru to Kozukata Village, a rural town where people walk around in suspiciously morose moods. Since asking people gets her nowhere, Kaoru finds herself staying with Izumi's family, who seem to be hiding secrets of their own. Everything leads to the upcoming Kakashi Matsuri (Scarecrow Festival), which the town anticipates as if it were Star Wars: Episode 3. Of more concern to Kaoru are the weird things that start happening in Kozukata Village. She begins having weird dreams, has visions of a red-garbed figure wandering the night, meets a missing Chinese exchange student (Grace Yip, moonlighting in Japan) and endures the icy glares of nearly everyone in Kozukata. After the one hundredth murderous look, you'd think Kaoru would get the hint, go find the cops and return in full force. Well she doesn't. Not only is her car broken down (Call a taxi, dammit! ), but Kaoru is drawn to the town's mystery, which encompasses the omnipresent scarecrows, old pal Izumi and perhaps even Kaoru herself. The particulars of Kakashi are never entirely explained, which is par for most Japanese horror films. The Ring didn't explain everything either, but the mythology and genuinely harrowing frights made up for it. Kakashi goes a similar route by expecting its atmosphere to compensate for the film's lack of disclosure. The atmosphere works for the most part, but it really isn't enough. Just because we know something bad will happen doesn't mean that we'll necessarily be satisfied. And besides, who decided that people moving slowly equals some form of horror? Making things more difficult is the lead character of Kaoru, who's supposedly implicated in Kozukata's impending evil. Whether or not Kaoru gets this isn't the fault of actress Maho Nonami (who's lovely and blank), since the film doesn't even give her any revealing dialogue. Whenever some important information is hinted at by a supporting character, all Kaoru has to do is ask, "What's all this about?" But she doesn't. She just barrels forth, ignoring the fact that she isn't really liked by the majority of the characters - hardly a sympathetic trait for the "hero" of the piece. Kou Shibasaki fares better as Izumi, as her devilish smile (which got great play in Battle Royale) is used to good effect. Still, she doesn't get enough screen time. Neither do Shunsuke Matsuoka or Grace Yip, neither of whom registers as a complete character. Notes: Kakashi is based on a horror manga by Japan's leading maven of horror manga, Junji Ito. His work Uzumaki (aka: Spiral) is currently available in translated form via Viz Comics, and other works of his are available in anthologies from Comics One. Other movies based on his works include Uzumaki, Tomie and Tomie Replay.